David Eric Casebolt isn’t the only one catching flak for the epic disaster that occurred after the McKinney, Texas, pool party. 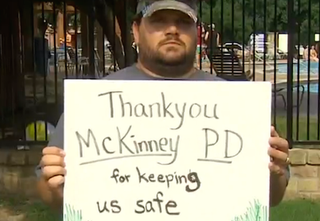 Toon is standing by his role in the incident and was seen holding up a sign expressing his support for the police officers who rounded up the teens after the pool party as if they were a recalcitrant herd of animals. Now black Twiiter is having a field day, mocking the fact that black people’s whereabouts are still being policed and are still provoking crazy reactions from some white people who question whether or not a black person ought to be in certain settings.